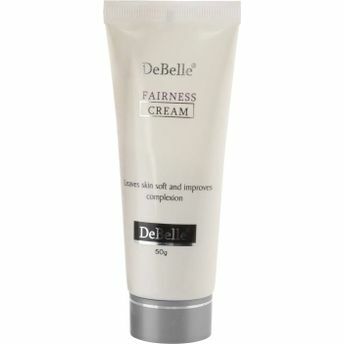 DeBelle Fairness Cream provides unique multiple benefits with the presence of natural extracts such as Mulberry extract, Koji and Coconut oil extract. Designed to protect and nourish your skin with DeBelle's naturally enriched products. Made from premium quality ingredients, it is sure to last for long. It provides a healthy radiant skin glow and brightens skin effectively. It contains anti-oxidant rich Mulberry extract, which helps to whiten the skin tone and eliminate dryness. Also has effective anti- pigmentation and anti-aging properties. Further it aids in moisturizing the skin, concelaing dark spots and provides UV protection as well. Non-oily cream which gives long lasting results. Enriched with anti-oxidant rich ingredients, this product will protect and soften your skin. Ideal for both men and women and suitable for all skin types. Fairness cream made with natural extracts. Nourishes and brightens skin tone. Carries anti-pigmentation and anti-aging properties. Explore the entire range of Face Moisturizer & Day Cream available on Nykaa. Shop more DeBelle products here.You can browse through the complete world of DeBelle Face Moisturizer & Day Cream .Alternatively, you can also find many more products from the DeBelle Fairness Cream range.